Do you want to bring your garden into your home in an elegant, permanent way? 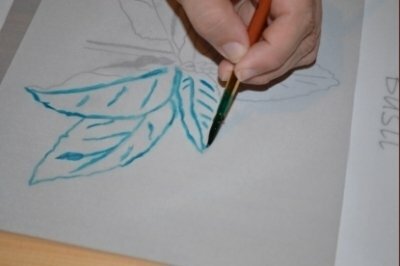 Consider making a screen printed botanical tea towel based on a photograph of one of your favorite plants. 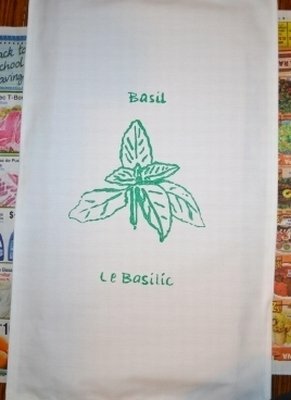 Tea towels can make decorative hangings (or be draped through the handle of your oven door), or simply be used for drying cleaned dishes or covering a tea pot or tea tray. For this project, you will need a tea towel. You could purchase one, but it is relatively simple to make a tea towel by cutting a rectangle out of cotton or linen and hemming all four sides. Given a ¼" hem, (doubled over to conceal a raw edge), cut your fabric 1" longer and wider than you want for the finished dimensions. Tea towels are considered to be "hand towel" size, which seems to vary somewhat. I chose a narrower towel (finished size 16"x26"). You could also cut your towel for finished dimensions as large as 27"x28", which seems to be a popular size. There are a number of ways to approach screen printing (The terms silk screening and screen printing are often used interchangeably, though the fabric involved is much more likely to be nylon than silk). Whichever method you use, you are creating a fabric or film stencil. The most traditional method of creating a design is by cutting out open areas into a piece of film especially designed for the process, but this film can be difficult to find. It is much more common to use a combination of drawing fluid/screen filler, or a layer of photo emulsion. As the photo emulsion method requires either drawing or printing a photo on acetate, I decided to use the drawing fluid method (if you can think in negatives, you can do this using just the screen filler, but my brain doesn't work that way). 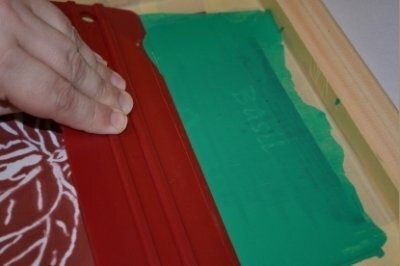 With screen printing, either there is an opening for the ink to go through, or there is a completely opaque area where it cannot. Photo-techniques aside, this lends itself to somewhat simplified line drawings. You can, of course, draw anything you like, but I wanted a realistic botanical sketch, so I started from a photograph of the plant in question (in this case, a basil plant). 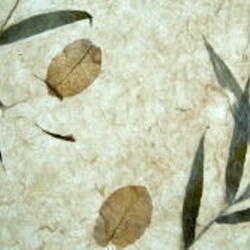 I used a piece of tracing paper to help me outline the leaf shapes, then embellished them with veining, including larger filled in areas to suggest dimensions and shadows. The instructions that come with the screen printing kit recommend using a soft pencil to draw directly onto the screen, but usually just tape my finished drawing to the back of the screen. 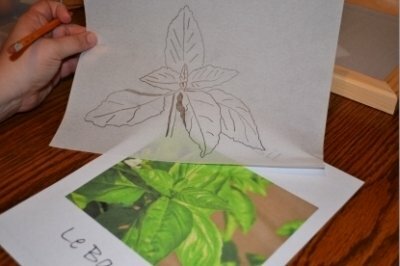 I then printed out the name of the plant in both English and French (I decided the botanical name was too long), and taped these above and below the image I had drawn. When I was happy with the layout, I painted the front of the screen with the drawing fluid (the blue gel), using the image for a guide. 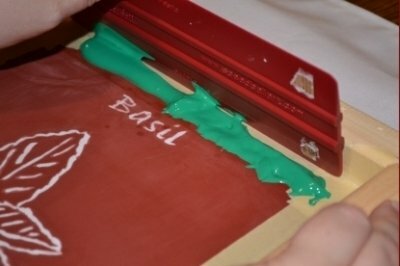 Note where I made a mistake at the top of the image, creating a "blop" around the "B" in "Basil." I'll be correcting that later. I then placed the screen up on feet to dry (you have to keep your work horizontal throughout the drying process). After I allowed the image to dry overnight, I spooned a line of screen filler across the upper area of the top of the screen (I left it elevated for this process). I then used the squeegee to create a thin layer of the filler across the screen. 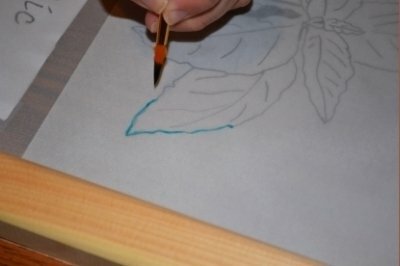 In areas where you have applied the drawing fluid, the screen filler will not stick. You are only supposed to make one pass when you do this, but after I let it dry, I found that there were an inordinate number of "pinholes" in the layer of screen filler. (Hold your work up to a light source to check for these, and correct them by filling in dots where the light shines through using a fine paintbrush). I spooned more screen filler onto the screen and created a second thin layer, which effectively filled the pinholes. Of course, I then had to let it dry again. The next morning, I used a hand-held shower attachment to gently wash the drawing fluid out of the screen. In some areas, I used the edge of a pair of tweezers to GENTLY scrape the lines clean. (Be very careful not to poke a hole in your screen, or you would have to start over with a new one.) I then returned the screen to its horizontal position to dry again. When it had completely dried, I used a fine-tipped paintbrush to apply screen filler to correct the "blop" I had made while painting using the drawing fluid. Once that too had dried, I proceeded to tape up the frame, on both the front and the back. This prevents ink from escaping through the edges of the frame and creating a "box" effect around your print. Make sure the tape overlaps both the frame and the edge of your screen filler. I laid down a layer of newspaper on my table, topped that with a piece of thick cardboard and place the tea towel over it. 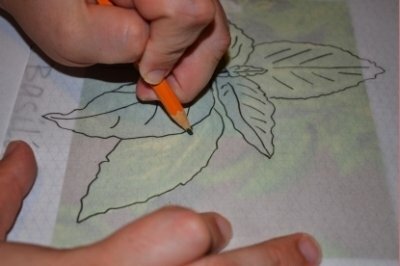 I then centered the screen on my tea towel, and applied a line of green ink (you can use your color of choice). While pressing down on the frame to prevent it from shifting while printing, I ran the squeegee across the ink, pressing hard to scrape an even layer of ink onto the fabric. I then pulled the frame up from the fabric, and allowed the resulting image to dry. After it was completely dry, I heat set the image, thus completing my work of art. 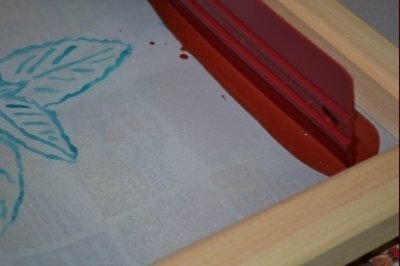 Once you have made a screen, you can use it to make multiple prints - and not just tea towels. You could put your image on decorative pillows, tote bags, tee-shirts, or even wood or paper items (just remember that for items with more than one layer, you need to place a layer of cardboard inside the item, to keep the ink from bleeding through to other layers). 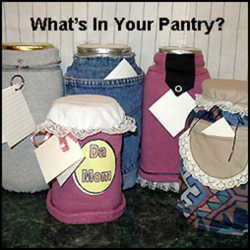 These items can be used to decorate your own home and life, but they also make unique gifts. 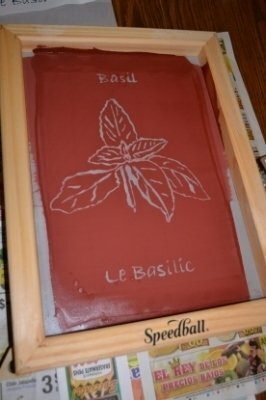 So give screen printing a try, and bring your creative side to your kitchen and your garden. NOTE: If you want to get a taste for screen printing without investing in specialty tools, you can improvise many of the elements with things you may have on hand from other projects. 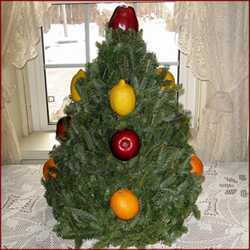 Of course, if you decide to continue with this exciting art medium, you will want to upgrade to proper frames and tools (which are not that much more expensive to buy than the following substitutes, especially if your craft store offers coupons, or if you buy a kit at a discount on-line). Organza or silk (or any finely-woven fabric - check thrift stores for curtain panels) stretched over an embroidery hoop can be used as the screen, though it is nearly impossible to "reclaim" or re-use this for another design. The negative space of a design can be created using Modge Podge as screen filler. As you will not have drawing fluid, you will need to create a "positive" stencil. It is easiest to print or draw your design onto sticker-back paper, cut it out, apply the sticker to the front of the hoop and paint the modge podge around it. Many people use an expired credit card or used gift card as a squeegee, but except in the case of very small images, it will not be wide enough to apply the ink in one pass.